Serena Williams had little patience for questions after she won her quarterfinal match in the U.S. Open, especially after a reporter asked her why she wasn't smiling. Serena Williams had little patience for questions after she won her recent quarterfinal match in the U.S. Open, especially after a reporter asked her why she wasn't smiling. 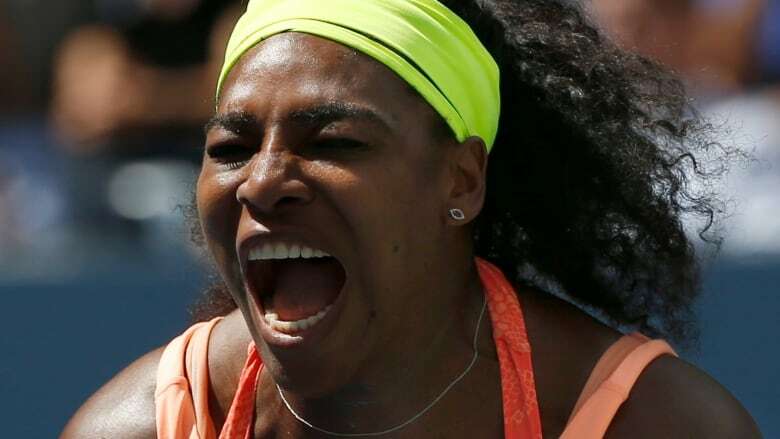 Serena had just ousted her older sister, Venus, in three sets. At a news conference some time after the match, Serena fielded a slew of reporters' questions. One reporter noted that Serena typically smiles, and asked her why this was not the case at the time. He suggested that perhaps the athlete was sad about beating her sister. "Um, it's 11:30," she started. "I don't — to be perfectly honest with you — I don't want to be here," Serena said. "I just want to be in bed right now. And I have to wake up early to practise. "I don't want to answer any of these questions. And you guys keep asking me the same questions," she continued. "You're not making this super enjoyable ... Just being honest." Her honest response elicited chuckles from her and the press audience. The same reporter than appeared to try to ask her another question. "Is it about Venus again?" Serena quipped. Those who saw the interview seemed to love her response. Some pointed out that male athletes would not be asked why they weren't smiling. Another person pointed out that it's not Serena's job to smile for reporters. Other athletes have faced seemingly sexist questions from reporters before. When Canadian tennis player Eugenie Bouchard reached a Grand Slam semifinal in 2014 a TV reporter asked her which celebrity she would most like to date. She answered Justin Bieber, and the exchange sparked a debate over whether the question was sexist. Female actors have faced similar situations. Model and actor Cara Delevingne was called out for her apparent lack of enthusiasm during a Good Day Sacramento interview about her upcoming film Paper Towns. After a couple of questions, including one about whether she had read the book, one of the anchors pointed out that Delevingne did not seem very upbeat. "I saw you in London talking a couple of weeks ago on TV, and you seemed a lot more excited about it than you do right now. Are you just exhausted?" "Oh, no. I mean, I'm still very excited," a seemingly startled Delevingne answered, adding that the film's premiere was the night before. "But I'm not any less excited than I was a couple of weeks ago. Maybe, I had a bit more energy. It's the morning." Everyone laughed, before an anchor piped in with "you do seem a bit, a bit irritated. Perhaps it's just us." "Yeah, I think it's just you," Delevingne retorts, and the anchor says they'll let her go to have a nap and an energy drink. Delevingne's feed suddenly cuts out, and the anchors go on to discuss how "she was in a mood." The author of Paper Towns, John Green, later defended the actor and called out the sexism behind some of the questions in the interview, especially whether Delevingne had read the book. "I watched as again and again, she was asked this question. Cara has read the book [multiple times], but the question is annoying — not least because her male co-star, Nat Wolff, was almost always asked when he'd read the book, while Cara was almost always asked if she'd read it," Green wrote in an essay on Medium. The bold emphasis is Green's. He goes on to explain the boring monotony of press junkets, and how he found himself sticking to a script when giving answers even if it did not feel genuine — something he says Delevingne won't do. "She refuses to indulge lazy questions," he wrote. "I don't find that behaviour to be entitled or haughty. I find it admirable. Cara Delevingne doesn't exist to feed your narrative or your news feed..."
That is what makes her so interesting, he says. Over the past few years, an online campaign dubbed #AskHerMore pressured reporters to ask female interviewees better questions on the red carpet. The campaign grew out of a frustration of hearing female actors being asked about whose dress they are wearing or to show off their manicures on the much-mocked manicam. q sports culture: The indomitable Serena Williams?